When she came up with an idea for a lemonade stand in 2012, Cassidy never dreamed it would turn into a Lemonade truck that she could take to events in the community. Today, the 9-year-old is the owner of Cassidy’s Lemonade Stand which raises funds to help find a cure for Cystic Fibrosis. 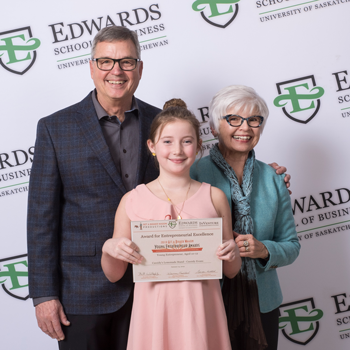 She is also one of the inaugural recipients of the Get a Bigger Wagon Young Entrepreneur Awards which were held as part of the 12th Annual Gordon and Maureen Haddock Entrepreneurial Speaker Series earlier this month at the Edwards School of Business. Young entrepreneurs aged 7 to 15 with an existing business were encouraged to enter for a chance to win a cash prize. The application process required submission of a two-minute video and a basic profit and loss summary of the business. Cassidy said she entered the competition after she heard about it from a friend of her mom’s and plans to invest the cash directly back into growing her business. “I will be using the prize money to purchase a new beverage dispensing system for my lemonade truck and finish the renovation on the interior of the truck,” shared Cassidy. 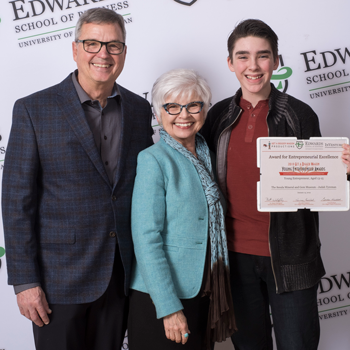 Adding the Get a Bigger Wagon Awards was a natural evolution to the annual speaker series and the Haddocks attribute the idea to Gordon’s upbringing, which allowed his entrepreneurial spirit to develop from a young age. 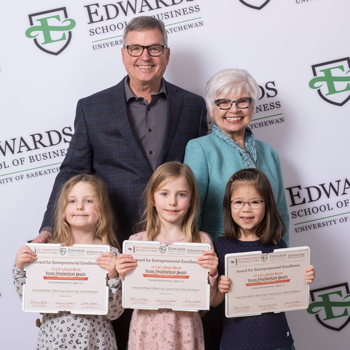 The husband and wife team started the Haddock Entrepreneurial Speaker Series at the Edwards School of Business with the aim of exposing students, faculty, staff and the entire community to entrepreneurship. 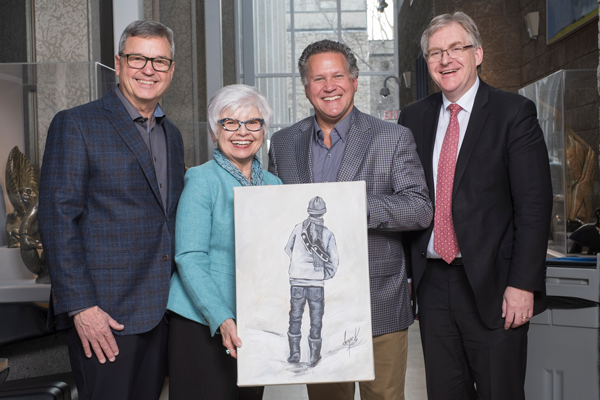 With these qualities in mind, Saskatchewan success story and uSask alumnus, Duane Smith, was selected as the 2019 guest speaker. 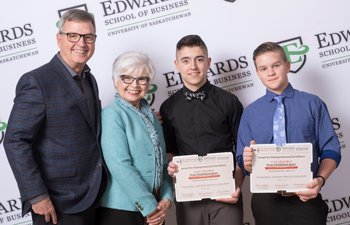 Smith is the former CEO of JayDee AgTech, and he shared lessons with students, faculty and community members from his early days as an entrepreneur to selling his award-winning company to the Jim Pattison Group. He got an early introduction to entrepreneurship when he took over his grandfather’s chicken business at the age of 12. He increased the number of laying hens and added broilers for roasting birds until he graduated high school. In 1987 he completed a Bachelor of Commerce degree at the University of Saskatchewan. Smith then went on to help grow JayDee AgTech to become the largest privately held John Deere Company in Western Canada, which was later recognized with the 2011 North American Dealer’s award. 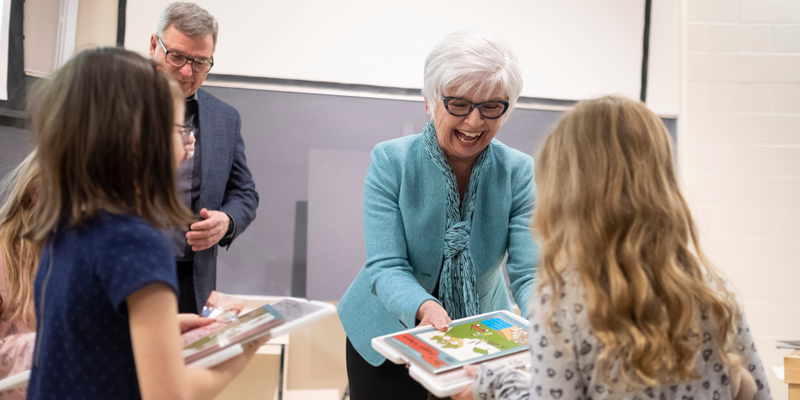 Looking back on his journey, Smith said his personal takeaways were giving back, recognizing the important role of family along the way and continuing to be strategic after being in business. As for the business perspective, Smith explained that managing a team and coordinating people resources are the toughest parts. Thank you to Gordon and Maureen Haddock for making this event possible.